The procedure of application-item restore from Veeam Agent backups differs depending on the type of the backup repository that you use to create Veeam Agent backups. For Veeam Agent backups created in a Veeam backup repository, the procedure of application-item restore does not differ from the same procedure for VM backups. To learn more, see the Restoring Application Items section in the Veeam Backup & Replication User Guide. For Veeam Agent backups created in a cloud repository, you can perform application-item restore using the backup console on the tenant Veeam Backup & Replication server. To learn more, see Restoring Application Items from Cloud Repository. If you use Veeam Agent for Microsoft Windows to create backups in a cloud repository, you can restore data from such backups using the backup console on the tenant Veeam Backup & Replication server. In the tenant Veeam Backup & Replication console, locate the necessary Veeam Agent backup. Open the Veeam Backup browser. In the Veeam Backup browser, browse for the database file of the application whose items you want to restore (DIT, EDB, MDF etc.). 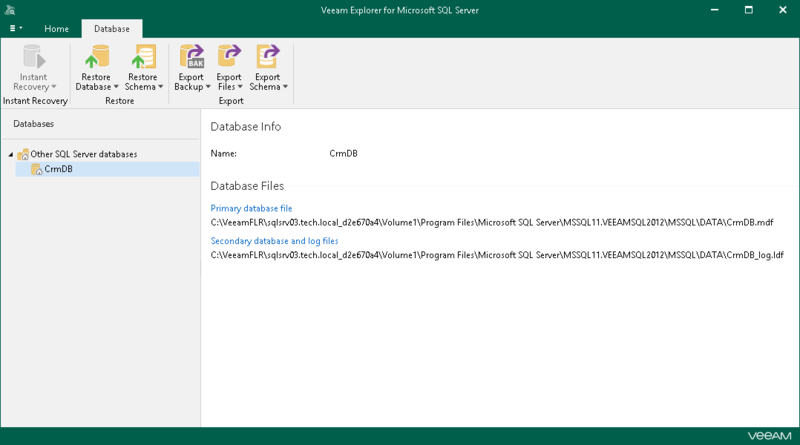 Double-click the database file to open the corresponding Veeam Explorer. Use the Veeam Explorer to restore application items you need. To learn more about application item restore from a cloud repository, refer to the Veeam Knowledge Base article at: https://www.veeam.com/kb2668.